Yoko Ono, Japanese multimedia artist, singer, and peace activist, welcomes guests to Strawberry Fields 's Central Park's living memorial to John Lennon, her husband and world-famous singer, songwriter, and peace activist. Strawberry Fields is a living memorial to the world-famous singer, songwriter and peace activist, John Lennon. During his career with the Beatles and in his solo work, Lennon's music gave hope and inspiration for world peace and his memory and mission lives on in Strawberry Fields. 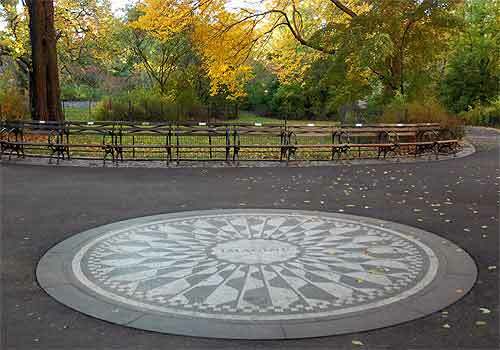 This tranquil section of Central Park was named after one of Lennon's favorite songs, "Strawberry Fields Forever." Recorded in 1966, the song's title comes from an orphanage in Liverpool, England where Lennon used to go to play with the children. His aunt, who raised him, disapproved but he insisted it was, "nothing to get hung about." Hence, the song's famous lyric. Strawberry Fields was officially dedicated on October 9, 1985, the 45th anniversary of Lennon's birth. Lennon's widow, Yoko Ono Lennon, worked with landscape architect Bruce Kelly and Central Park Conservancy to create a meditative spot. The mosaic was created by Italian craftsmen and given as a gift by the city of Naples. Based on a Greco-Roman design, it bears the word of another of Lennon's songs: Imagine. A designated Quiet Zone in the Park, the memorial is shaded by stately American elms and lined with benches. In the warmer months, flowers bloom all around the area. Along the path near the mosaic, you'll find a bronze plaque that lists the 121 countries that endorse Strawberry Fields as a Garden of Peace. West Side between 71st and 74th Streets.